Senator Schumer wants to argue about tax reform at Thanksgiving dinner. And he has a handy chart for lefties to take along and wave at their more conservative relatives while screeching about the 1 percent. In an article titled, “The Case for Ruining Thanksgiving,” GQ Magazine urges its readers to punish their parents who voted for Trump by staying away, insulting them, or ranting about police brutality. “Thanksgiving: The annual genocide whitewash,” declares Al Jazeera. 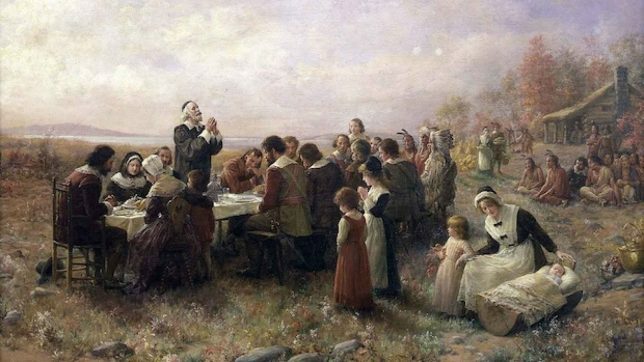 “The Thanksgiving Day story represents the violence of colonialism,” fumes Bustle. Retelling the story of Thanksgiving, pardoning a turkey and watching football are all “offensive, racist, or just plain problematic.” And if Thanksgiving with lefties wasn’t miserable enough, the Village Voice offers five politically correct television episodes to inflict on your “terrible aunt or insufferable uncle” who don’t want to admit they voted for Trump. What animates the left is the conviction that everything (except their own tastes, preferences, and opinions) is terrible and must be reformed until it too is like them. America is racist, homophobic, transphobic, Islamophobic, arachnophobic, and claustrophobic. Every second the prison-industrial complex is gunning down drug dealers for no other reason than the color of their skin (and the guns in their hands), the military-industrial complex is bombing countries full of terrorists just because of the color of their skin, and the turkey-industrial complex is destroying the environment. To be thankful is to be reminded of what we are fighting for. The resentful left doesn’t really fight for anything. Its resentful causes have no endpoint. There will never be a time when race relations, the environment, social mobility, and caloric intakes are good enough for them to hang up their hats. The left maintains a perpetual state of crisis because it justifies a perpetual state of resentment. The War on Thanksgiving is the campaign of a hostile leftist movement that is pessimistic and arrogant. Ruining Thanksgiving is its mission. And it isn’t out to win an argument but to ruin an American tradition.